Cute, huh? 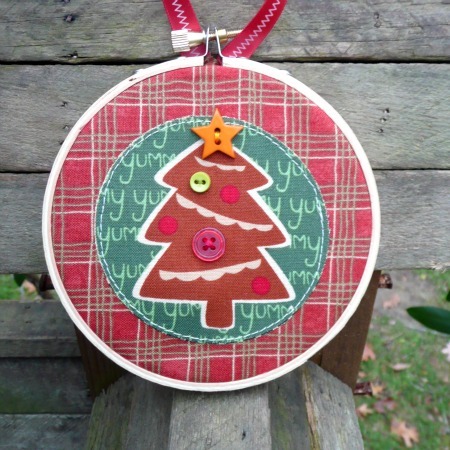 This project has several other uses besides as a Christmas tree ornament. It can be hung on the wall as a decoration, on a doorknob, around the neck of a wine bottle. It also makes a great little handmade gift. I think I might be making a few more of these as gifts for my daughter's preschool teachers. And here's some good news for all of you who don't sew and always tell me you wish you could... This ornament can be made two ways. One way requires a little sewing; the other requires NONE. Yippee! Everyone can make one! 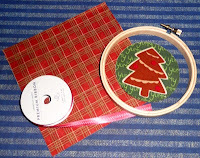 First cut a small piece of fusible web and iron it onto the back of your Christmas fabric. Make sure it covers the back of the entire image you want to cut out (in this case, the entire circle with the tree image). Do this before you cut out your circle. After it cools, cut around the 3" circle. 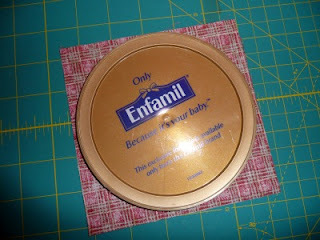 Cut your 5½" square piece of background fabric into a 5 1/4" diameter circle (Hint: A large powdered baby formula lid is the exact right size to trace!). 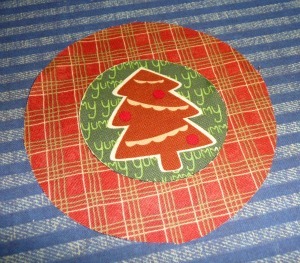 Peel the fusible web paper from the back of your Christmas fabric circle, and center this circle on your background fabric circle. Iron in place. (If you don't sew, you can skip this next step...) Applique your Christmas fabric circle onto your background fabric circle by sewing a straight stitch about 1/8" from the edge. 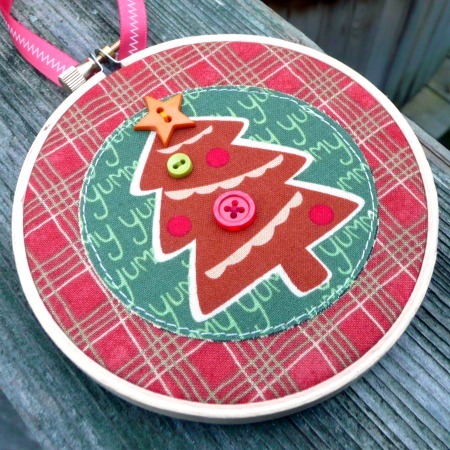 Center your fabric circle in your embroidery hoop and tighten. 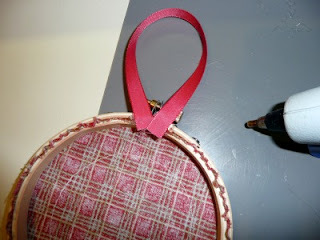 Trim extra fabric from the back of the hoop. Hot glue your ribbon or ric rac onto the back of the embroidery hoop. 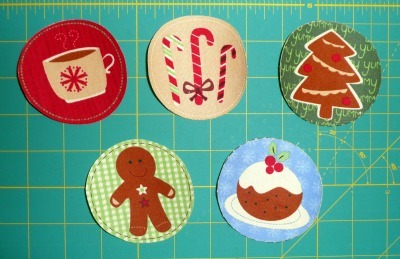 If you are sewing, sew the buttons onto your Christmas fabric however you like. 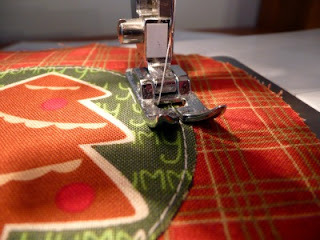 If you are not sewing, hot glue the buttons onto the fabric. Now you've seen the first project created with this quarter yard of fabric. Be watching for the other four projects over the next couple of weeks. Thanks for stopping by today! We're less than two weeks away from the first day of Haul Out the Holly!!! I can't wait! 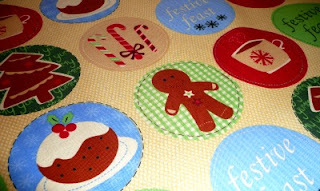 Super-cute fabric! I can't wait to see what you do with the little cup of hot chocolate...that's my favorite circle! 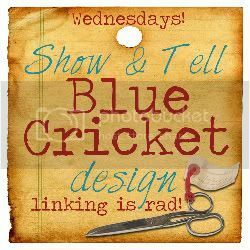 This is fabulous, I love how cute it is and it seems like you should be able to make several in just a little bit! Can't wait to see the rest of your ideas! Hi Gwen, lovin' your tutorial, definitely one I'll keep in mind in the coming weeks. Thanks. Very Cute! I am going to try this! Well, this is cute....and I am in need of a circle pattern just that size.....and that's the formula my DD uses!! THanks for the hint! You come up with the coolest ideas! Looking forward to seeing the rest. wow gwen you always amaze me-- you have the creativity and the skills to come up with some fabulous and original projects! Neat idea and I love the fabrics you picked. This is so cute! 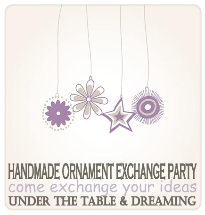 I need an idea to make for the ornament group I'm in, so I may use this. Very clever! Which Joanns did you buy the fabric at? City, & state. I would love to do this with my grandkids. Can you tell me what kind of fabric it was? @carol mendell: I believe it was a cotton print designed specifically for JoAnn stores.